It was the gentleness and patience plus coddling, cuddling and non-stop attention that we noticed first of the Mothers with their babies. And it was totally amazing to see them showing such compassion and love for their little infants when they are such huge and powerful animals. 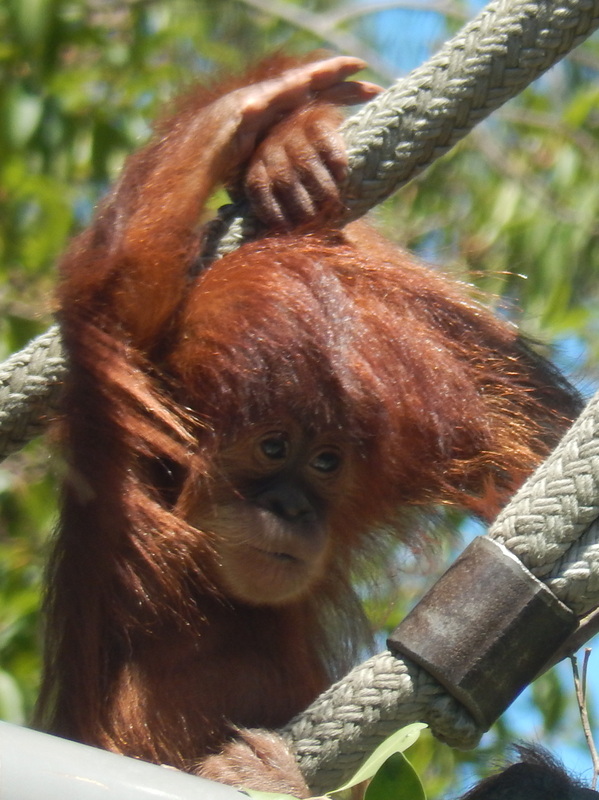 Aisha carefully moves a few inches on the climbing apparatus from Mom Indah. 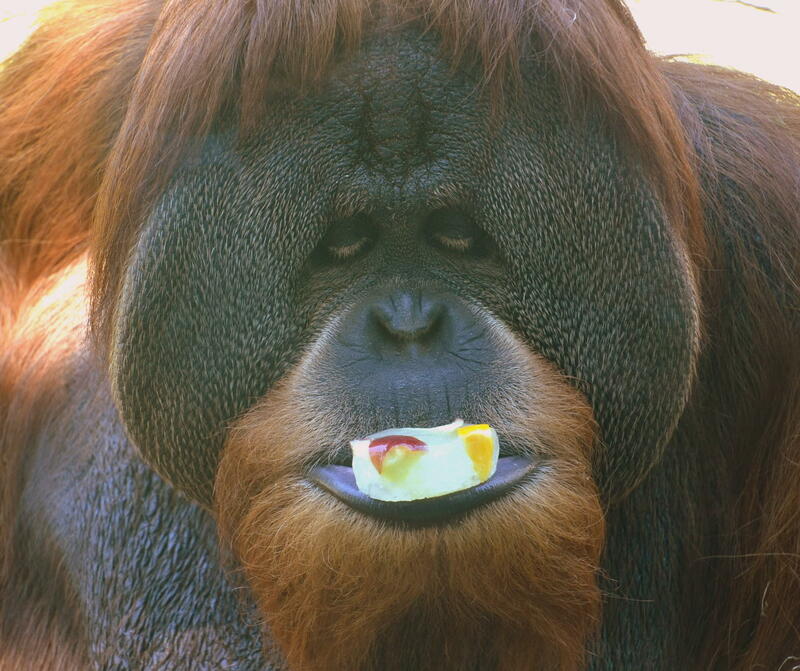 But Indah and Imani have almost the same DNA as humans explaining their Mother human-like behavior because Indah is an orangutan and Imani is a gorilla who live at the San Diego Zoo and the San Diego Zoo Safari Park. 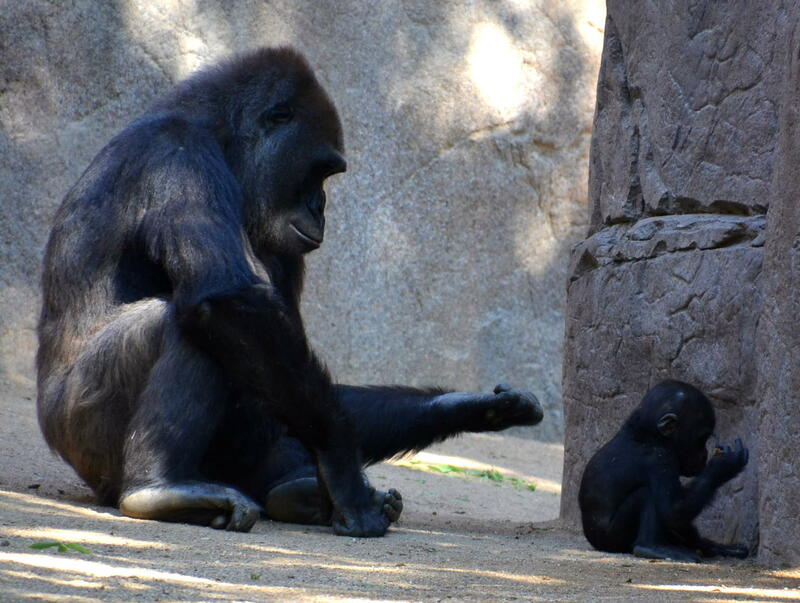 Imani lets her little infant Joanne on the ground for a little free time to play. 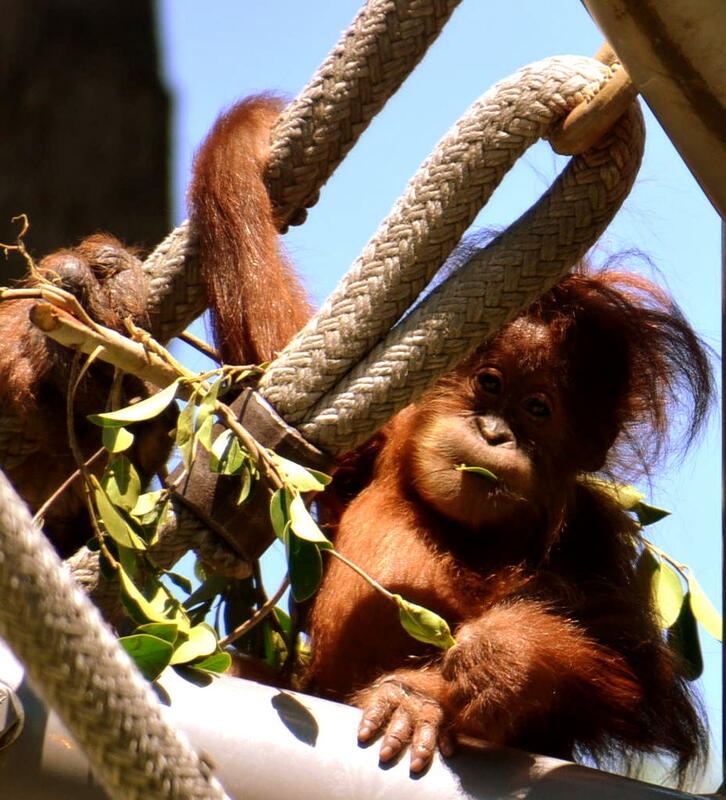 When we saw Aisha, the 9-month-old daughter of Indah and Satu in the San Diego Zoo, she was hanging on tightly to her Mom, Indah, on the climbing apparatus in their exhibit as they sat in the shade. Indah with her baby Aisha patiently watches her. Carefully and slowly, Indah let Aisha move several inches from her on the ropes, and then several more inches, but always making sure her large Mother orangutan hand was close by in case anything happened to her. Photo by Denise Carlson of Aisha close to Mom. Indah swings Aisha on her stomach while hanging on to the climbing apparatus. 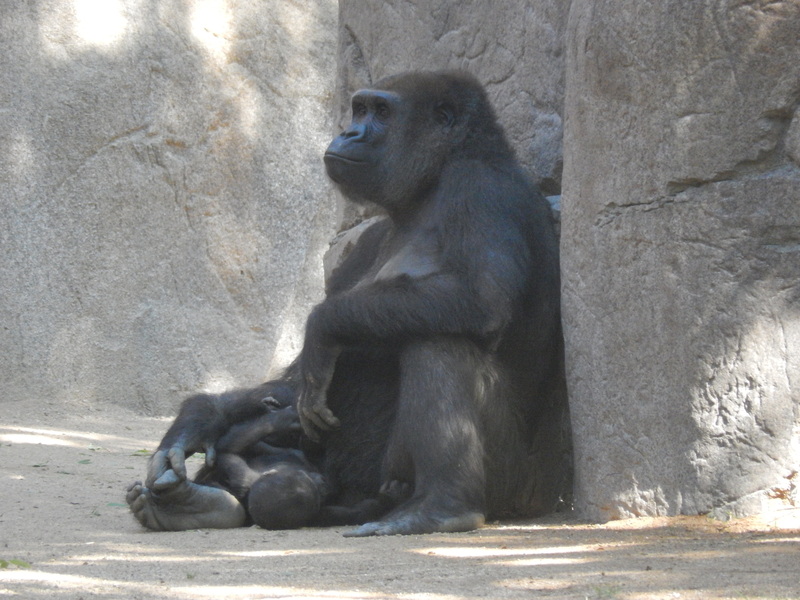 And Joanne, the 4 1/2-month-old daughter of Imani and Winston at the San Diego Zoo Safari Park, was sitting next to her gorilla Mother when we arrived. And Imani was allowing her to play on the ground right beside her leg. Joanne gets a ride on Momma back because she can’t walk at almost 5 months of age. The ape infants develop like human infants since they have almost the same DNA as humans. But then, it was time to move to another position in the exhibit because 3-year-old Monroe and 5-year -old Frank were play fighting, and pounding their chests to show each other who is dominant. 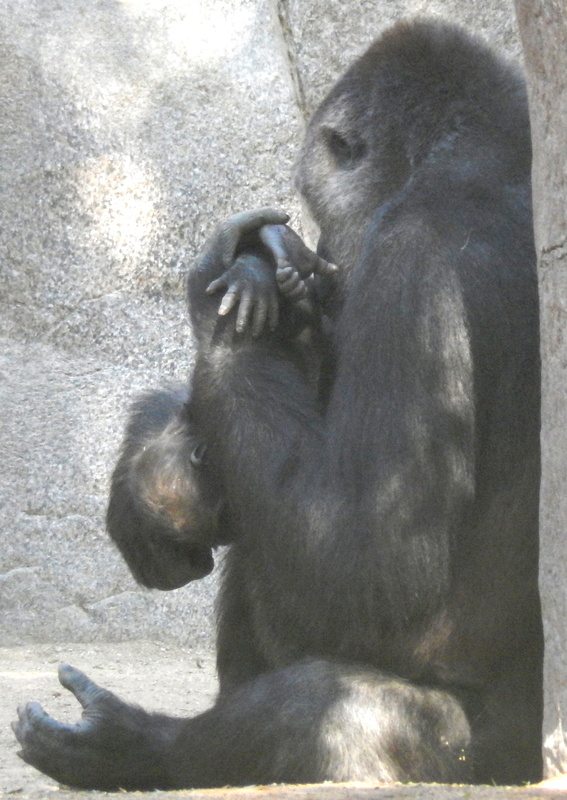 Imani did not want her baby Joanne to get hurt by their rustling and tussling game. And thanks to the expert Vets, University of California San Diego medical team and keepers at the San Diego Zoo, Joanne and Aisha are alive and well. Baby Joanne, named for Joanne Warren, first chairwoman of the San Diego Zoo Global Foundation, was delivered by a rare emergency C-section on March 12, 2014 by the Zoo’s Vets and the UCSD medical doctors and nurses. The C-section was performed after Imani made no progress after showing signs of labor earlier in the day. Weighing just 4.6 lbs., Joanne was born with a collapsed lung and pneumonia. So she was placed in the Zoo’s Intensive Care unit where she received 24/7 care until she was ok.
Joanne’s dad, Winston, checks on his baby regularly. Meanwhile, in her Safari Park bedroom, Imani was healing from her emergency Caesarian section surgery. And to keep her company, zoo officials allowed Frank to be with her because she had raised him and they had bonded. 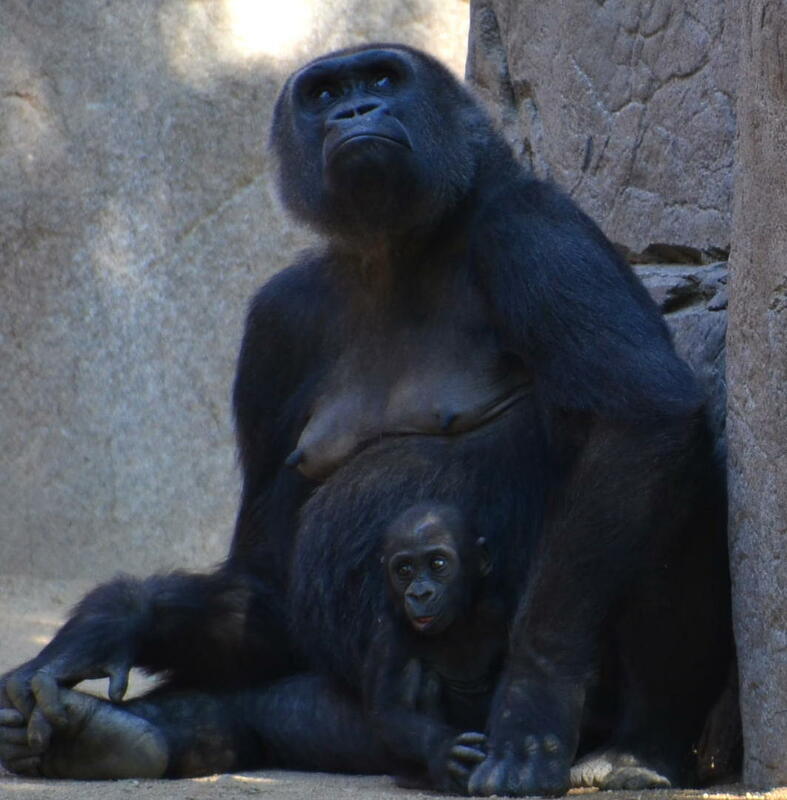 Two weeks later, Joanne was well and ready to join her Mom Imani who took her in her arms immediately and 3 hours later Joanne was nursing and Mother and Baby were inseparable. Shortly thereafter, Imani let Frank hold Joanne for a few minutes. 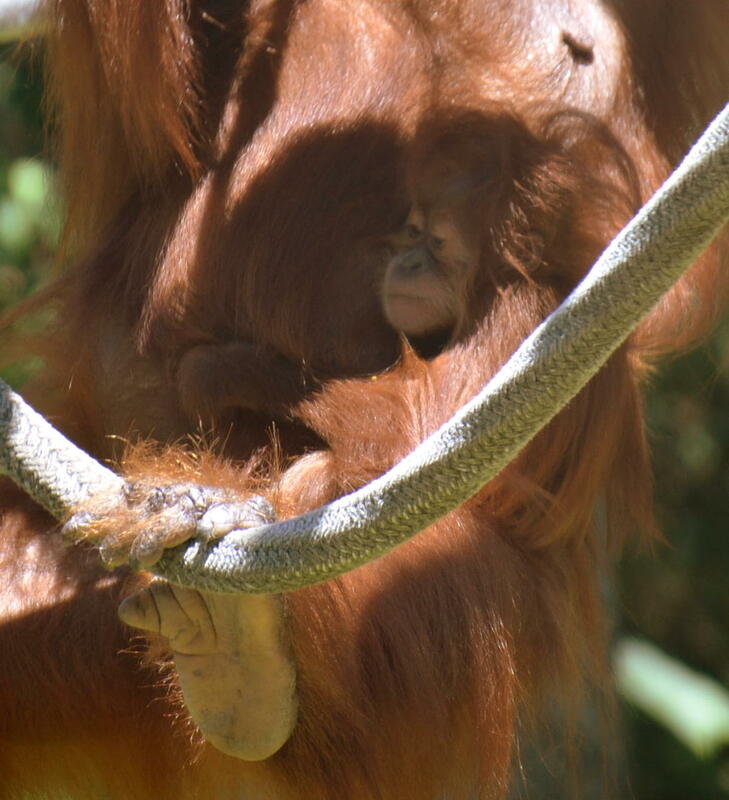 Photo by Denise Carlson of Aisha hanging on the ropes a few inches from Momma Indah. 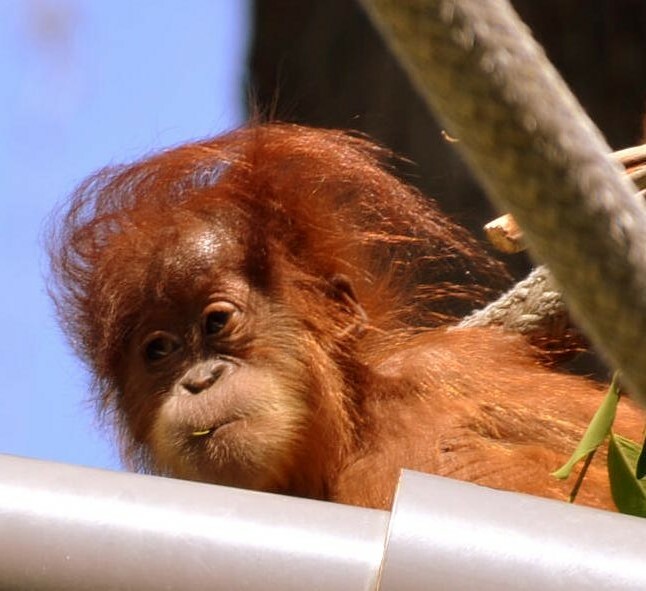 Aisha was born Oct. 25, 2013 when her Mom, Indah, delivered her by natural childbirth in her San Diego Zoo bedroom. 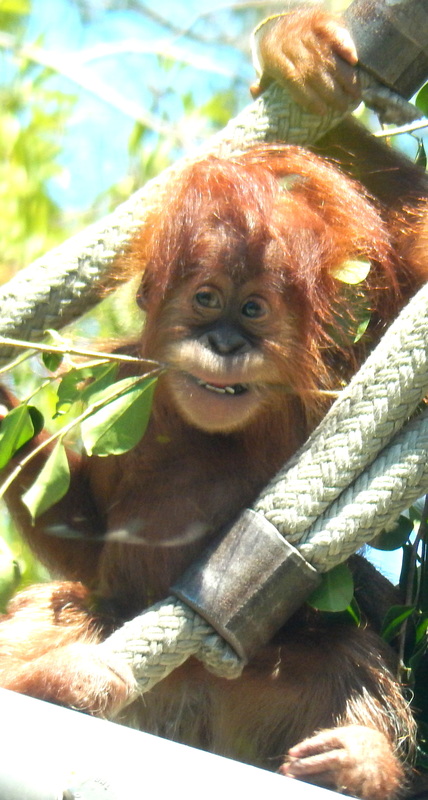 Aisha was Indah’s second baby, having had son Cinta a few years earlier. Photo by Denise Carlson of Aisha holding on the rope real tight. 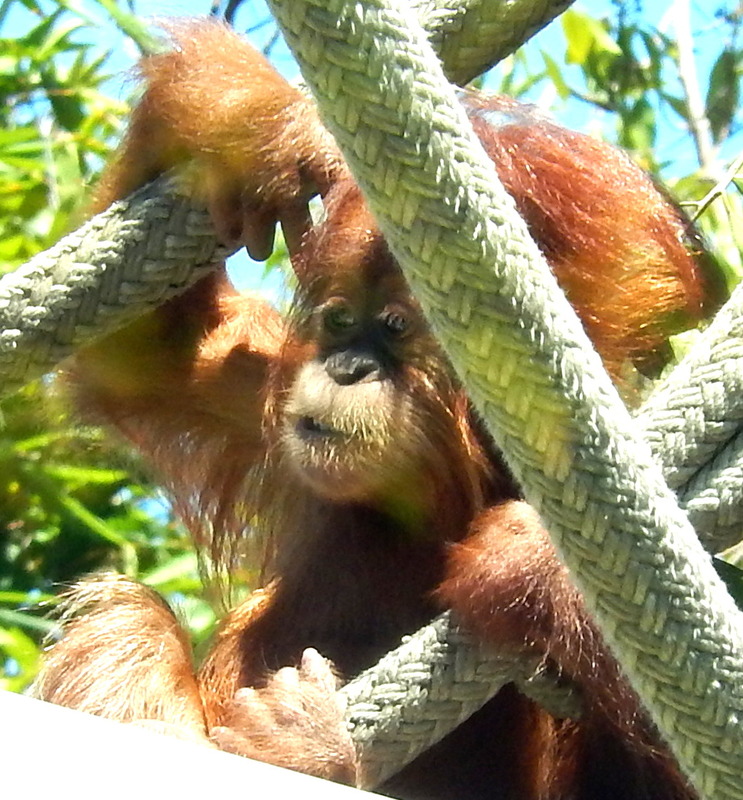 When a keeper came into her bedroom, Indah held up Aisha for the keeper to see her. The keeper was so pleased to know Aisha was doing fine and trusted here by showing her baby. And then she saw baby Aisha was a female. 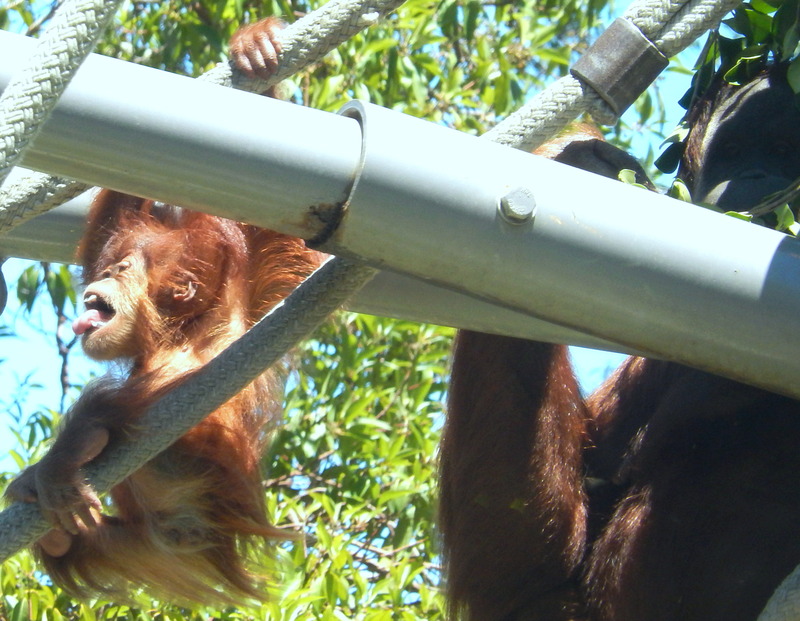 From the ropes on the climbing apparatus in their public exhibit, Indah and Aisha then leave the exhibit for the bedroom to spend the rest of the day in private. There, Indah lets Aisha play on the floor and enjoy more time to explore on her own. Photo by Denise Carlson of Aisha gnawing on a soft branch. Because both babies have DNA close to humans, they develop like humans. Both are beginning to chew at leaves, branches and the same food Momma eats. And when Mamma eats food, the babies sometimes reach for it. Both have a few teeth and are still nursing. 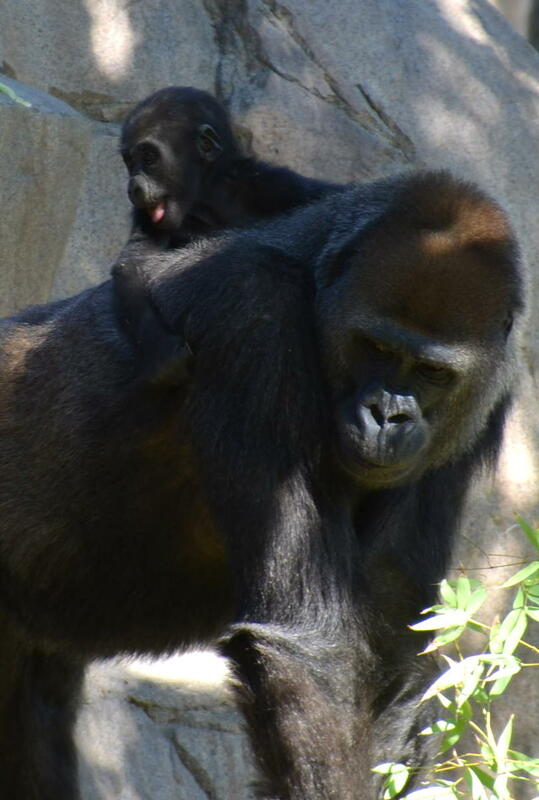 Imani lifted baby Joanne up to her back so they could move away from the sparing boys. 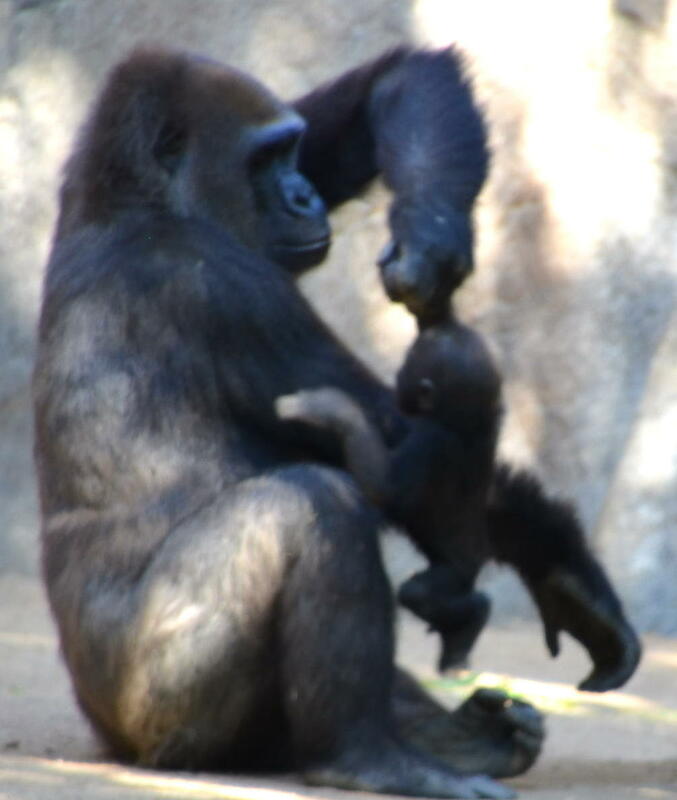 Photo by Denise Carlson of Imani playing with baby Joanne. Boys will be boys and chest pounding was being practiced many times. 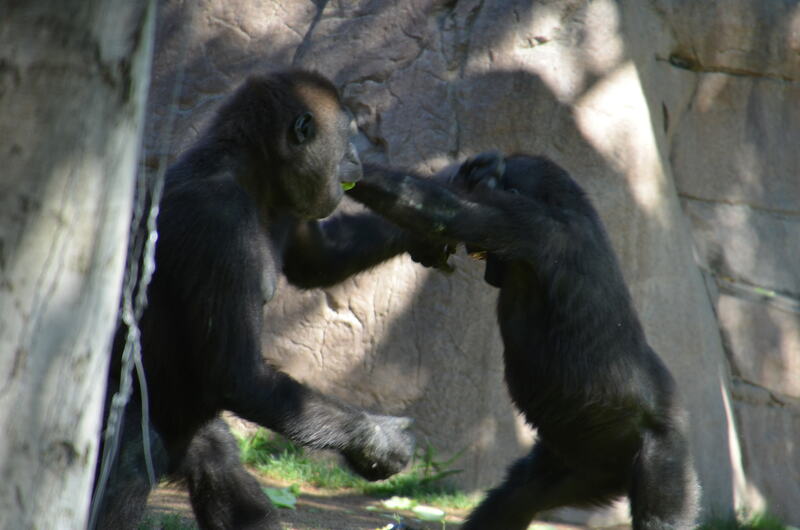 And gorillas, Frank and Monroe, continue their play fighting and chest pounding so Imani takes Joanne back to the bedroom until they calm down. Daddy Winston comes into the exhibit to see what is going on and then he leaves for his bedroom. 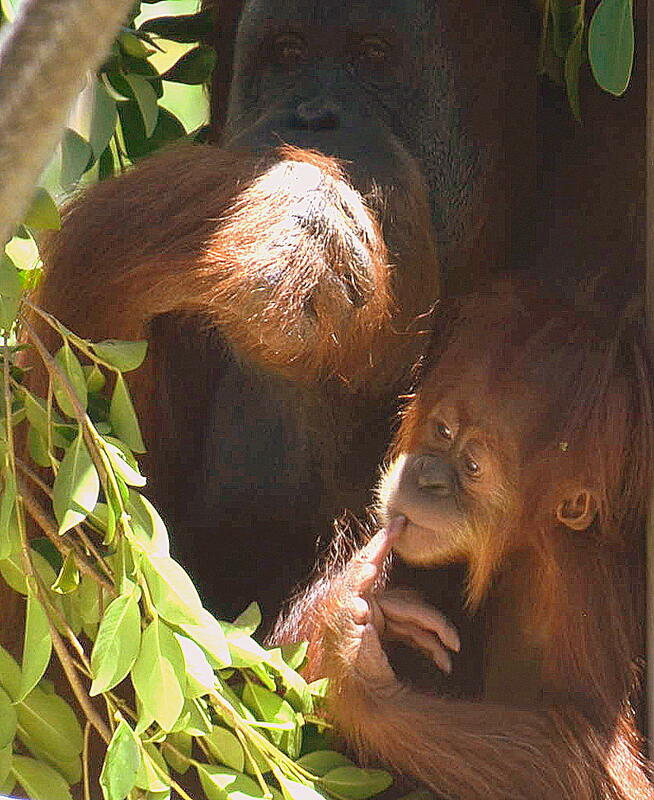 Satu, Aisha’s Daddy, eats a piece of fruit for a snack and regularly checks on his little girl. 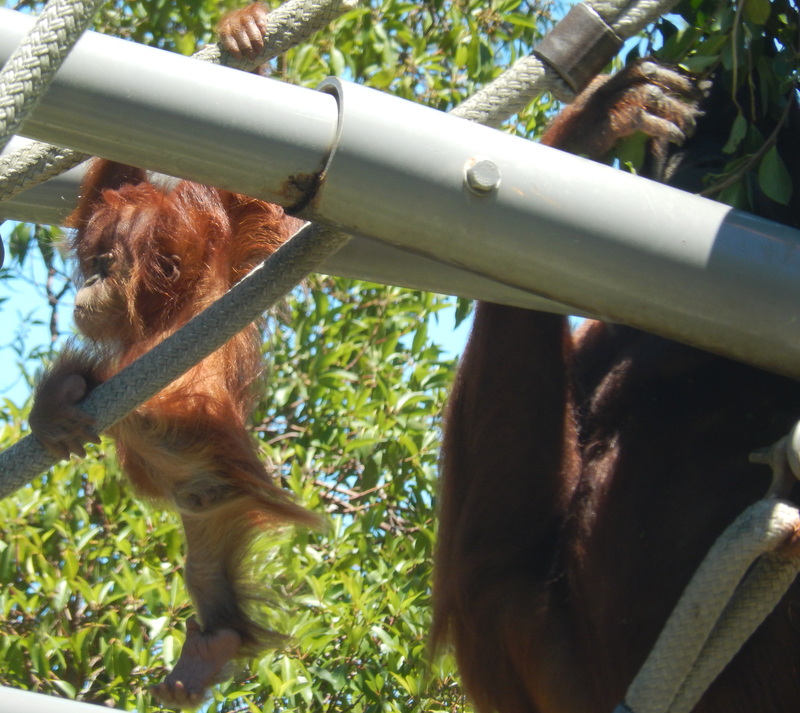 Watching the orangutans and gorillas living their lives in the San Diego Zoo and Safari Park is a wonderful adventure. And watching each gorilla and orangutan Mom taking excellent care of their baby in a loving and compassionate manner is a priceless joy. 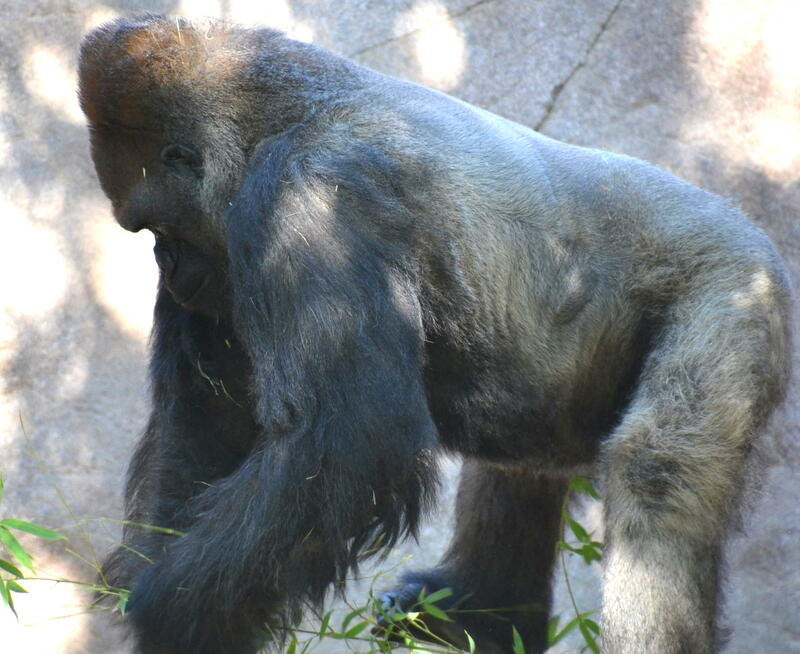 Thank you I am a zoo member and you covered my two favorite animals you did a beautiful job..Franks Birth Mom Aziz has delivered another Baby Boy at Disney animal Kingdom on August 7th 2014.